Every time I turn around, I see a number of tanks and larger models being put down on the table. It's not a bad thing, but if I've always struggled with finding a way to transport my two Land Raiders and a pair of dreadnoughts along with my handful of troops... what in the world do folks use to transport a fleet of tanks, a squadron of Valkyries or any kind of superheavy? I know there are companies out there making specific case for folks with these kinds of armies, but what do you guys do? As most of you all already know, I can't figure out why people wouldn't find a way to protect their models investment with a good, solid case. I've talked about carrying cases before on a couple of occasions and even gave a few tips for making your own custom foam trays for your more odd shaped models. 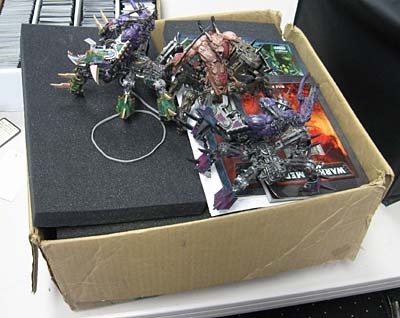 Chaos Daemon Engines scramble to escape "the box"
I know some people toss all their stuff into a cardboard box and tote it back and forth to the game store. I know others go all out and get the best they can for their models. So what's out there to protect your models? I don't know off the top of my head so I went looking to see what I could find. Specializing in foam trays and carrying cases. Able to produce custom sized/shaped foam inserts. Catalogue can be requested here. They've got a few different choices that are already designed. In this case, it's a matter of picking one that might best suit your needs. Specializing in foam trays and carrying cases. These guys have the kind of foam trays where you "pluck" out the sections to create the sized openings you need. You just have to buy the correct depth of foam for your models. Similar to GW, these guys have a few different choices that are already designed. In this case, it's a matter of picking one that might best suit your needs. Again, similar to GW, these guys have a few different choices that are already designed. In this case, it's a matter of picking one that might best suit your needs. These guys have the kind of foam trays where you "pluck" out the sections to create the sized openings you need as well. You just have to buy the correct depth of foam for your models. Not the biggest selection of options, but still a choice. And there is the option of building your own or taking something else and using it instead of buying a brand name. But all this still leaves me wondering what about those really big models? What do you do to make sure those are transported safely? UPDATE: I had one of my friends send me the trick he uses to transport his Valkyries. 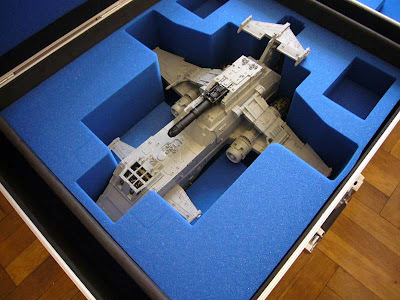 He has magnetized the front portion of the cockpit and then can set them inside foam inserts in a shoebox that then fits nicely into his carrying case. I (personally) plan to spend a good deal of money on my case. I do not intend to build my own or rely on any kind of trick to transport my models. I will purchase the best case that money can buy. Why? Because my Stormraven cost me over 60 US Dollars in addition to paint / glue and I easily spent 10+ hours painting it. Even minimal wage that is 7.40 (Ohio) effectively doubling the cost of that model. So yes...I plan to spare no expense. That does not mean, however, I will just go out there and buy a gold plated case either. I am simply stating I will buy the best case for my needs. I've been very impressed with my KR case throughout year or so that I've had it. Definitely going to get more of them. They've saved my models from rain and damage on several occasions and they also keep the dust off! I've always been tempted by battlefoam but the price is a bit obstructive! I used to use the Sabol pluck-foam trays, but found with the exception of the 'motor pool' size, the trays just weren't big enough. Recently I've been going with the Battlefoam trays which I've been rather pleased with, primarily because they fit perfectly into the standard size boxes I can get from the post office, which means I a) can use it as a carry case, and b) when the time comes to sell the models, I just have to tape up the box and it's more or less ready to ship. I am not much of a fan of their pre-cut trays however, as my models end up being a bit more 'dynamically posed' than their pre-cut trays tend to allow for. Their pluck foam is just right for my needs... Granted, it's a bit more expensive, but I find it's worth the expense if you want to protect your models. Another great article, by the way - keep up the great work! I have a very dificult time paying for my minis, but as someone said if you do it for your minis in money and time then you owe to your self to protect them. So I decided to order a Sabol army Transport, I'm pleased with the quality but I wish it would let me a bit more flexibility. About purchasing a new bag I don't think so because the last time I did it it cost me $200 in transport cost. so im already looking for new options. Excellent, thanks for the honest feedback guys. It's good to hear some personal experiences. Something else I've wondered though... is the carrying case(s) a financial consideration when starting an army? I mean if you're going to run lots of tanks/flyers/vehicles... you're going to need to transport them safely. Does that factor in to whether or not you decide to start that kind of force? When I first started I did the old 'sling in a box and hope for the best' transport mechanism. I didn't have much cash for models let alone transporting them. Now I have a number of cases and vastly more foam of the precut from battlefoam/GW/Figures in comfort and pluck-and-play kind for different models. I load up various foam trays with armies and share cases, swapping the contents depending on what I'm playing. It requires a bit more thought than a pick up and go prepared case but it saves space and money. Great appreciation for these links. I had been on the market for a case myself, recently. Reece: Why did I suspect that? And when are you going to get your IG tank out of my showcase! Karl: Excellent, I'm glad it helped. Do your research and I'm sure you'll be able to come up with something that suits your needs. 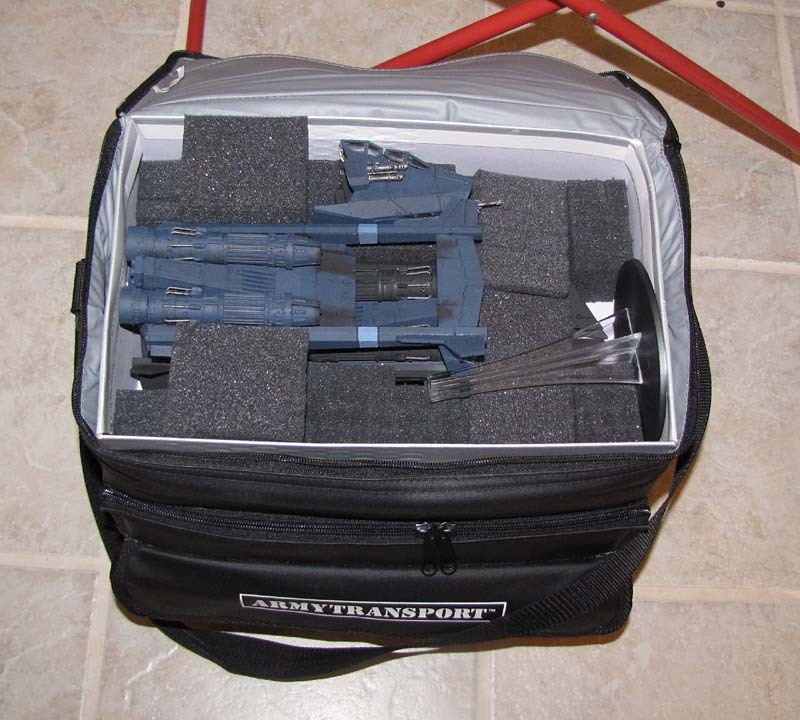 When I started my Dark Angels army a couple years ago, I gave no thought to transport. And for the first year, until I got into the swing of things, all I had was the minis from AoBR and the Space Marine Battleforce, all unpainted, so I didn't worry about it. I've since invested in the Armytransport and Armytransport Motor Pool carriers; the tall, regular one holds all of my *many* troops choices, with some of the deep foam also accomodating a Rhino, Dreadnought, and DA Company Master. When I finally picked up a Drop Pod and Land Raider Crusader, I found that the Motor Pool carrier holds them just fine. One word. Battlefoam. Or is that two words? Whatever. For me, Battlefoam is my weapon of choice for one major reason. Quality. They've thought of everything from triple stitching to hard inner shells to quality metal clips. It's simply a bag you can trust. It seems like most folks who go the distance to protect their models usually have a favorite company/brand they will use over all others. I have 3 thunderhawks, a reaver and a warhound. I pack the titans in bubble wrap if they ever leave the house, and the thunderhawks leave on custom built bases. truthfully, I would like something more sturdy, but I have no desire to spend an equivalent of what I spent on the model for a case for them - I've only seen battlefoam with cases that could handle the thawks and warhound. I'll be buying custom trays from Battle Foam one or two at a time as I get the money to spend on them. After I have all the trays, I'll pick up a PACK 1520 from my gaming store in order to support them. C Trudden: Holy Cow! I'd be too afraid to even try to transport them. I don't know if all that would fit into my car. Myles: While I tend to make my own foam trays, I too wait until I have them and then get a case that will hold all of them. I've been using KR cases for a couple of years now, before they twigged onto the GW stuff so I don't have any of their more custom cut stuff, but they are really good. Despite weekly use the first case I bought is still in great condition although I did have to reinforce the hinge with some gaffer tape. The foam is really nice and soft so you can happily "squeeze" the odd shaped models in there without any risk of damaging them. Andy: That seems to be the case most often... buy a good one and it will last you a while. Then it becomes a matter of getting the foam inserts you may need as your army grows.